How I love chickpeas or as some call them, garbanzo beans. I was not always a fan but over the past 5 years we have become very close. I make La Cecina which uses garbanzo bean flour (recipe coming later this week), hummus and these little gems. All three of them traveled with me to the IFBC (International Food Bloggers Conference). They were practically all I lived on during the conference. More on that later. 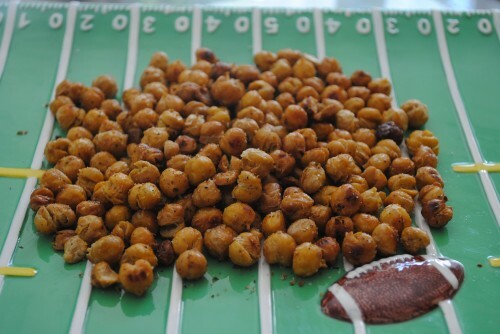 Now many people have shared recipes for roasting chickpeas. The most recent was Jaden Hair on Steamy Kitchen. So I’m going to refer you to her post where she shows you with great photos step by step how to make this recipe. I have only changed a few things but this is a basic recipe most people use. (I am not sure if the spices she used are gluten free so check your spices before jumping in). First, I didn’t use a convection oven like she did and it takes my chickpeas more like 45 minutes to cook and get crispy. I would suggest you start checking after 30 minutes to see how they cook in your oven. I will say I have pulled them out and let them cool a little only to find out they were not as crunchy as I had wanted. I just put the pan back into the oven for 5-10 minutes and that did the trick. Next I like to vary my seasonings. Most recently my favorite is a Turkish Blend from Penzeys. It contains salt, cumin, garlic, half-sharp paprika, black pepper, Turkish oregano, sumac and cilantro. I also love to sprinkle it onto my hummus with a little olive oil. Also, I like to use Eden Organic cans of chickpeas because the cans are BPA free. I’ve never had a problem with their products as far as cross contamination but you should be ever vigilant with anything you eat. Now I’ve also made a variation on this with nuts called my Amazing Toasted Nuts. So if you are looking to expand this beyond beans, give that one a try. After you rinse the beans you need to dry them or the oil will just roll right off. Toss them in oil and put them on your cookie sheet. I like to line the sheet with foil so there is less clean up for me in the end. Bake 30-50 minutes in a 400 degree oven or until crispy but not burnt. As soon as you take them out sprinkle with salt and seasonings. Now I’m not good at letting them cool before I start popping them into my mouth so I sometimes get burnt. I like to see if they are as crunchy as i like but use caution and your own better judgement than mine. Also, let them cool completely before putting them into a container. If they are still hot and you seal them in, you will steam them and they will no longer be crunchy. It’s rare but sometimes they do make it into a container. It’s usually a little baggie that goes into my purse for trips or my “emergency stash”. The ones pictured above are ready for the NFL season opener game on Thursday night. Last year’s Super Bowl teams are playing again. I wonder who will win this one? Give these tasty treats a try and let me know what seasonings you like on yours. Don’t forget to check out Jaden’s post for the pictures and she also has a list of where you can find more recipes using different spice combos. So I hope this recipe has you thinking about chickpeas. They are the Secret Ingredient for Friday Foodie Fix this week. Feel free to make a variation on this recipe and share it then. Sounds yummy Diane! So many people have made these and I haven't tried them yet! I need too soon! That turkish seasoning sounds wonderful! Oh, I've got to give these a try! Looks great. Let me know what seasonings you try Heather. Carrie I'll warn you, they are addictive. I've been wanting to try these since I saw them on Steamy Kitchen. I'm definitely making them tomorrow, and will try a couple of different spice blends. I love Penzeys' spices, just picked up Zatar seasoning which I'm dying to try, so this will be a great excuse to break it open. Can you tell me where I can get the Turkish Seasoning? Christina I used the blend from Penzeys Spices. They have stores but you can also buy online from their website. I use almost all of their spices and herbs.